Situated amid 23 miles of stunning beaches, this oceanfront hotel is just moments away from the Daytona International Speedway. This beachside hotel is perfect for those who love parasailing, fishing, biking and more. Guest rooms feature ocean views, HDTVs, and comfortable Hampton Beds®. Enjoy private beach access or relax at the heated oceanfront pool and whirlpool. 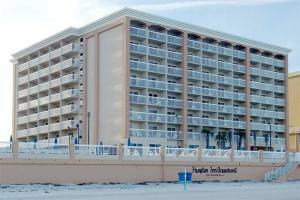 Located about 10 miles from the Daytona Beach Regional Airport.